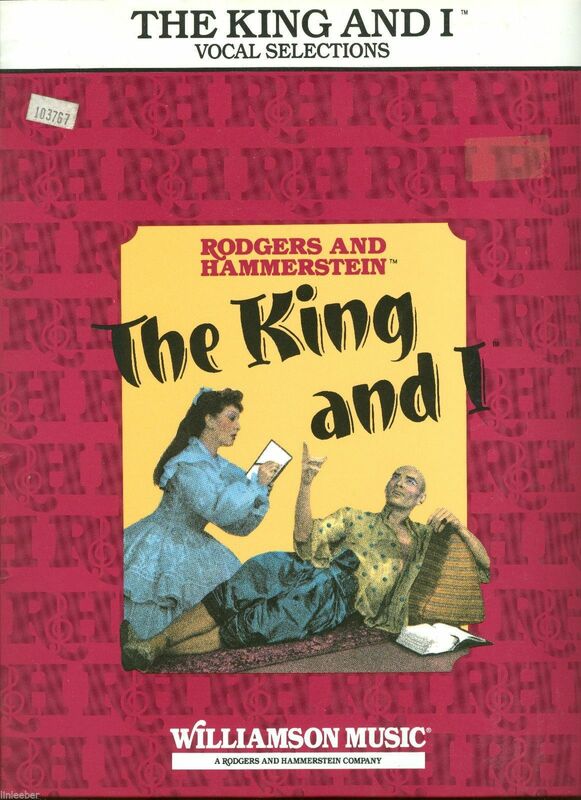 "The King and I", Rodgers and Hammerstein II, Vocal Selections, Copyright, 1951 by Richard Rodgers and Oscar Hammerstein II. This copy published by Hal Leonard Publishing Corp. Milwaukee. This paperback edition is 39 pages long and is in Near New Condition. Song titles include: "Shall We Dance", "Something Wonderful", "I Have Dreamed ", "I Whistle A Happy Tune", "Hello, Young Lovers", Getting to Know You", "We Kiss In A Shadow", "March of the Siamese Children", “My Lord and Master”. ISBN:0-88188-089-2 List price: 8.95. Printed in the U.S.A. book condition- very good; tight binding, clean pages, glossy cover. removable sticker on upper left corner with store identifier number. very slight bumped corners.